Look Who’s Charging was named winner of CeBIT PitchFest on the final day of CeBIT Australia. Ten of Australia’s leading start-up companies went head-to-head to pitch their company idea to a panel of esteemed judges at one of Australia’s leading top entrepreneurial competitions. The winner, Look Who’s Charging, is a Lake Macquarie based FinTech start-up that has set out to simplify the process of recognising unknown bank statement transactions and reconciliations. Stuart Grover, Founder of Look Who’s Charging, commented on the PitchFest win, and the opportunities CeBIT Australia and TiE Sydney, a global entrepreneurial community, have created for Look Who’s Charging. 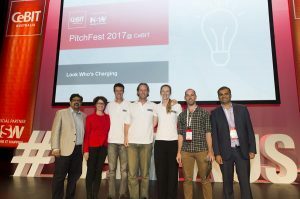 “Winning the prestigious CeBIT PitchFest competition provides validation that our mission, to eradicate the 10 million plus hours Australians waste trying to figure out who has charged their card, is a core issue that every Australian can relate to. Raj Dalal, Principal BigInsights and President of TiE Sydney, Maureen Murphy, Commercialisation Adviser, Accelerating Commercialisation, Look Who’s Charging co-founders David Washbrook, Stuart Grover and Nicole Grover, James Cameron, Partner at AirTree VC and Nitin Singhi, Director at TiE Sydney. “This is our first PitchFest competition, and already doors have opened with meaningful business and investor conversations. Thank you to CeBIT Australia and TiE Sydney for continuing to foster an ecosystem for start-up organisations and innovation to thrive across NSW and Australia,” said Mr Grover. Australian and international leaders in the start-up sector judged each of the ten entrepreneurs in a ‘Shark Tank’ style competition. Judges included: Maureen Murphy, Commercialisation Adviser, Accelerating Commercialisation; Raj Dalal, Principal BigInsights and President of TiE Sydney; and James Cameron, Partner at AirTree VC. Look Who’s Charging has won a package valued at over $20,000 including an exhibition stand at CeBIT Australia 2018, a 12-month hosted cloud services package from OrionVM valued at $1,000 per month, and a 1-year membership to TiE Sydney. Second place and third places went to Sydney-based start-ups Rivuu, a social media content approval and scheduling tool, and Sound Scouts, an app that is revolutionising hearing tests for school-aged Australians through gamification. Both start-ups will enjoy a 1-year membership to TiE Sydney. “The NSW Government is investing in our state’s start-up sector because we recognise the potential to create jobs and economic growth. It was fantastic to see eight out of the ten PitchFest finalists were from NSW – it shows our state truly is the start-up state, home to 40% of Australia’s start-up founders. “Congratulations to Look Who’s Charging for taking out the 2017 PitchFest title and I look forward to hearing more about their progress into the future,” said Mr Blair. Earlier in the day, the StartUp conference opened with Nick Kaye, Chief Executive Officer, Sydney School of Entrepreneurship, who reiterated the importance of ‘Fostering a Culture of Innovation’ through collaboration, active encouragement of students and businesses to be entrepreneurial thinkers within the dedicated start-up stream. Start-ups will contribute $1.09 billion to the Australian economy by 2033. CeBIT Australia will return to ICC Sydney to showcase the best business technology from across the Asia Pacific region on 15-17 May 2018.